This is a line from this blog post about how to be a lucky guy. If you read the post you'll find it in context. Thought it was a good line and that you too might enjoy it. Also read about 10 more posts this guy, James Altucher, wrote. James is the guy in the video below telling you not to give to charity. Not exactly, just not to charity organizations, I plan to give directly to some poor person in my neighborhood who's having a tough time from now on. Unless they decide to give me money first. I think its a real heads up to let you know you should read Jame's blog. Point is that explaining is draining. I wish someone would explain for me how insane it is to order 30 pizzas or more for a party from a pizza shop when you could have the slice truck come there instead and serve pizza that is the greatest ever and also serve it hot. 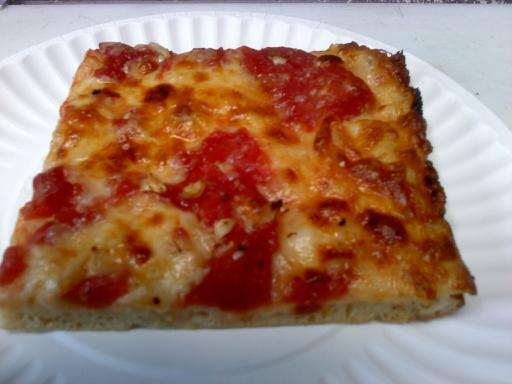 This is a grandma slice, our slices are in triangle shape unless you get a grandma. What are you thoughts on Austin Texas? We're thinking of putting a truck there and giving a report on the differences of doing business in Texas compared to California.